Just wanted to pop in and say HAPPY NEW YEAR everyone!! Tim and I are going to a friends house to play board games, eat good food and just hang out and ring in the New Year! His dad is going to babysit the girls for us so we can stay out late *BIG grin*. Which reminds me I gotta run and get chooping up the fruits and veggies for the Sweet Cinnamon Waldorf salad I'm bringing (doesn't that just sound yummy??)!! Have a safe and fun evening everyone - and I'll see y'all in 2007!!! As you will undoubtedly see - these are NOT the "masculine paisley" card I said I was gonna post today - that card will have to wait till tomorrow or Monday - but I WILL get it posted! Anywho - there was a thread on the demo side of SCS about getting "patterned" letters using the Monogram stamps and patterned paper. And LeeAnn (you ROCK!!) posted that she just stamped the letters in VersaMark and clear embossed them. Can you believe that I've NEVER thought of that??? It was a total *smacks forehead* moment for me ROFL!! 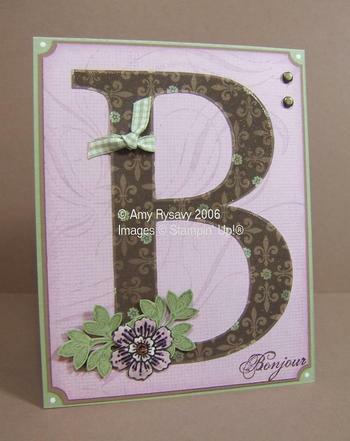 STAMPS: Monogram "B", Carte Postale, French Flair, Canvas. CS: Whisper White, Mellow Moss, Pale Plum, Close to Cocoa, Enchante DS Paper. INK: VersaMark, Basic Black, Mellow Moss, Pale Plum, Perfect Plum, Close to Cocoa. ACCESSORIES: Clear Embossing Powder, Moss Gingham Ribbon, Crystal Effects, Ticket Corner Punch, Sponge Daubers, Vintage Brads, White Gel Pen. I stamped the "B" using VersaMark onto the Enchante Designer Series Paper (from the Stampin' Up! Winter Mini), embossed it with Clear embossing powder then cut it out (leaving a slight border around it). I just LOVE how it looks embossed on patterned paper! It's SO simple yet looks so elegant! I stamped and cut out the flower and leaves, and covered the flower w/ Crystal Effects to make it "POP" a little more. STAMPS: Monogram "F", Love Matters, Dotted BG. CS: Whisper White, Cool Caribbean, Close to Cocoa, Pretty in Pink, Loves Me DS Paper. INK: VersaMark, Chocolate Chip, Close to Cocoa, Regal Rose, Pretty in Pink, Taken w/ Teal, Certainly Celery Stampin' Write Markers, Cool Caribbean. ACCESSORIES: Iridescent Ice Embossing Powder, Flirty Ribbon, Soft Subtles Brads, Tag Corner Punch. This one took a couple of tries. I originally embossed the "F" w/ clear EP - BUT it looked *awful*. I don't know about you - but my Clear EP isn't really clear - it's got specks of black, glitter, white etc etc etc that have snuck in the jar over time - and when I embossed on the lighter patterned paper - it ALL showed up. (When I did the "B" - since the paper was darker you can't really see the "specks" unless you look *really* close). SO - after learning that unless you have CLEAR EP (LOL - I'm gonna have to get a new jar and try really hard to KEEP it clear!) - you need to stick to darker patterns of paper if you want it to look good! So for this card I embossed it w/ Iridescent Ice EP and got a much better result. I inked up the letters from the Friends stamp in the Love Matters set (also in the SU! Winter Mini) using Stampin' Write Markers, colored them in after stamping them, and adhered that to the Cool Caribbean CS. I then tied on a bit of the Caribbean ric rac ribbon onto the "F", and adhered that on top. I'm actually pretty excited about this "new" (to me anyway!) way to use my Monogram stamps. Except for the Prima Card I made the other day I haven't used my Monogram Stamps for a LOOOONNNNGGGG time and was debating getting rid of them - now I wanna play some more w/ them! Say that one 3 times fast! ROFL!! STAMPS: Pig and sentiment - GinaK Designs, Weave and Paisley BGs - SonLight Impressions. All available at stampingfreak.com. CS: Whisper White, Close to Cocoa, Pretty in Pink (all Stampin' Up!). INK: Palette Hybrid Noir (by Stewart Superior - available from TAC), Pretty in Pink, Regal Rose, Close to Cocoa (all SU!). ACCESSORIES: Stampin' Pastels (SU! ), Brown Organdy Ribbon (Jacksonbelle Embellishments), Marvy Mega Circle and Giga Scallop Circle Punches, Paper Piercer, White Gel Pen, White Grosgrain Ribbon (SU! ), Sponge Daubers, Dimensionals, Bazzil Brads in Hershey. So to get this piggy to look paisley, all I did was stamp the Paisley BG onto a scrap of white CS, then stamp the pig over it. I then colored in her nose w/ a marker and cut her out (so easy as she's just a circle). 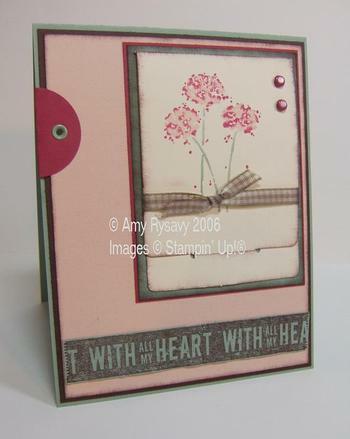 I then stamped the pig again onto white CS, and punched it out w/ my Marvy Mega Circle Punch. I "grounded" the image by rubbing on a little Cocoa pastel, and colored in the ears w/ the same marker I used for the nose (Regal Rose from Stampin' Up!). I glued the "Paisley Pig" on top of the other one, added a "bow" (I just tied the ribbon in a knot, trimmed it, then used a mini glue dot folded in half to adhere), then sponged the edges. Wanna Giga Scallop Oval Punch??? Or is the title all Greek to you??? ROFL!! I am shocked (SHOCKED I tell ya!!) to see that Gina is giving away yet ANOTHER giga scallop punch!! This time it's the Giga Scalloped Oval Punch!!!! She's so generous!! 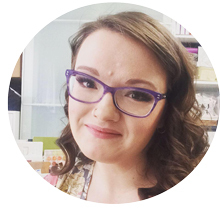 Head on over to HER blog (right here) and leave a comment on **this** post (click on it - it's hyperlinked and will take you right to the post) - she'd like you to share one of your best stamping tips and by doing so you'll be entered into a draw to win that FABOO punch!!! And if you want those punches really bad and don't want to take a chance on her little contest - you can order them here. Don't forget that stampingfreak.com has a special going on too w/ those punches: Order a combination of one Giga, one Mega and one Super Jumbo punch and get a Ultra Clean stamp cleaner FREE! "the brads placed here... the layer onto which the brads are poked seems to lay so flat onto the layer behind, are the brads poked through 2 layers and then cushioned up by dimensionals on the card base or do you snip your brads?" Well Julie (and anyone else who wants to know :o) - the brads on this card show through on the inside of the card itself - I just poked holes through after I was done assembling the card and stuck them on!! I AM one of those ppl who doesn't care if the backs of my eyelets and brads show. Every once in a while I WILL try to conceal them - but I usually don't bother. I like the layers on my cards to lay flat (or as flat as possible) and when I *try* to conceal the backs of brads (w/ eyelets it's easier as the backs of those can usually lay pretty flat - but the prongs on brads stick out a lot more) it creates bumps and whatnot in the CS anyway and (to ME) I think it ends up defeating the whole purpose in the first place!! If someone sends me a card and I can see the backs of the brads/eyelets used when I open the card, it won't in anyway detract from the delight I'll feel at getting a hand-stamped card!! I honestly *never* thought it was such an issue until I started seeing threads on the topic on SCS - and I guess it really *does* bother some ppl!! So that's my 2 cents on the whole backs of brads and eyelets showing issue!! What do you all think?? Is it a total non-issue? Or is it really *bad* "stamping etiquette" to allow the unsightly backs of brads and eyelets show through on the inside of your cards??? STAMPS: Monogram "B" (Stampin' Up! ), Paisley BG (SonLight Impressions). CS: Certainly Celery, Whisper White, Bravo Burgundy, Pale Plum. INK: Certainly Celery, Bravo Burgundy. ACCESSORIES: Prima Flowers, Dimensionals, Sponge Dauber, Celery Brads. 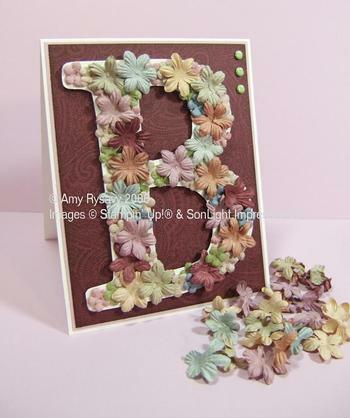 I got the inspiration to cover a letter w/ Prima Flowers from a Scrapbooking magazine I picked up over the holidays. It was a little time consuming to glue on all the flowers (and yes I was covered in glue by the time I finished!) but I had fun doing it! I stamped the Monogram B stamp onto Certainly Celery CS, cut it out and then matted it w/ Whisper White CS. I then glued on all those Primas using Mono Multi glue (that stuff ROCKS - a tiny little bit goes a LONG way!!). I kept the rest of the card super simple as the B packs a pretty big punch all on it's own! I was going to include a tag w/ a "Happy Birthday" sentiment but instead I'll stamp Happy Birthday on the inside. I *just* got this Paisley BG stamp in the mail this afternoon and HAD to use it for this card -I've been wanting this stamp for a LONG time and it's finally here!! After stamping it (and sponging the edges of the CS), I matted it w/ Pale Plum, adhered that to the card, then added the brads and adhered the "B" w/ dimensionals and that's it! On a side note - several ppl have been asking how Veronica's been doing (I posted about her getting croup here) which is so sweet of y'all! She doing a LOT better - we've had a couple of rough nights of her up coughing and crying, and she was complaining that her stomach hurt (no wonder w/ all the coughing - poor kid). She ended up throwing up yesterday but we think that helped as she threw up a lot of the phlegm and whatnot that was making her so sick. So she's getting better! But now Josie is getting sick (again! ), she's got a slight fever and is coughing too - so I'm keeping a close eye on her and *praying* it doesn't get worse! I hope everyone had a good Christmas! We did pretty well even w/ the girls not feeling well. We didn't get a lot of pictures (they never stay still long enough!) but they were all film ones so I have nothing to share on here! Sorry!! I DID get the Adobe Photoshop Elements 5.0 program from my Dad *happy dance* - so now I just need to get it on the computer and learn how to use it! I got a few other fun goodies too but I'll post about them later! Stampingfreak.com - purchase a combo of one Giga, one Mega, and one Super Jumbo Marvy punch (3 punches altogether) and receive a FREE bottle of Ultra Clean Stamp Cleaner. Splitcoaststampers.com - purchase a Fan Club Subscription (or re-new and existing one) and get a FREE SCS t-shirt (while supplies last) - valid Christmas Eve (Dec 24) through to New Years day (Jan 1st). Purple Onion Designs - 25% off ALL stamps - sale ends Jan 1st. Mandarin Pixie - selected sets 20 - 40% off - sale ends Dec 31. Win a Free Giga Scallop Circle Punch!! Gina's got a contest going on her blog right now - if you leave a comment on this post (on HER blog - not mine!) you'll be entered in to win a draw for a FREE Marvy Giga Scallop Circle Punch!!! Too cool!!! You MUST enter if you don't already have one of those baby's - I LOVE LOVE LOVE mine and use it so much - can't imagine my stamping life without it LOL!! I WISH I could give away a punch like this - but it took ME forever to track down the only one I've got and you'd have to pry it out of my cold dead fingers *wink* - I think it's pretty awesome of Gina to give something away like this!! Very Happy Holiday Wishes from Tim, Amy, Veronica and Josie Rysavy!! So anyway I made 2 cards the other night while I was up w/ Veronica - I went w/ the Color Combo and Sketch Challenges posted this week on SCS (great way to get the creativity flowing - and I sure needed all the help I could get that night!!). SETS: Happy Harmony, Handle With Care, Linen. CS: Sage Shadow, Rose Red, Blush Blossom, Chocolate Chip. INK: Sage Shadow, Rose Red, Blush Blossom, Chocolate Chip. ACCESSORIES: Very Vanilla Pocket Notes, Moss Gingham Ribbon, Rose Red Brads, 1 1/4" Circle Punch, Sage Shadow Eyelet, Sponge Daubers. I used the new SAB set Happy Harmony for this card. I inked up the flowers w/ Stampin' Write Markers and stamped them onto the Pocket Note. I then sponged all the edges, added some ribbon (also sponged to make the difference between the moss color ribbon and the sage shadow CS less noticeable *wink*) and and a couple of brads. I made sure to be careful when gluing the pocket note to the other layers to NOT glue where it closes so that it can be opened and either a "secret" message or something like a gift certificate can be tucked in there. The rest of the card came together pretty well after that. I stamped Linen on the Blush CS (tho you prolly can't see it! ), and sponged *most* of the edges of all the layers. 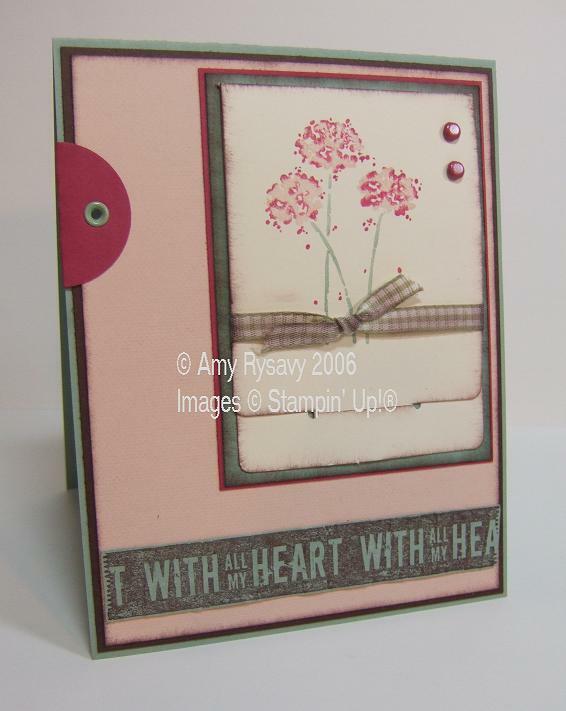 Instead of stamping the 'With All My Heart" stamp directly onto the Blush CS, I stamped it on the Sage, cut it out, then crumpled it out and flattened it before gluing it onto the card. It has a nice textured look and feel to it - I had originally tried stamping it on twill w/ craft ink but b/c it's such a solid stamp I wasn't pleased w/ the results and went w/ this instead. SETS: Carte Postale, Linen, French Flair. CS: Confetti White, Whisper White, Rose Red, Blush Blossom, Sage Shadow, Enchante DS Paper. INK: Black Stazon, Blush Blossom, Rose Red, Sage Shadow, Chocolate Chip. ACCESSORIES: Vintage Brads, Paper Piercer, Cutter Kit, Stamping Sponge, Chocolate Grosgrain Ribbon, Narrow Wine Organdy Ribbon, dimensionals. The Carte Postale set and all the stuff that matches w/ it is SO not my style - but I thought I'd get it all anyway and see what I could do with them!! I stamped the flower stamp onto Confetti White CS w/ Black Stazon, watercolored it w/ re-inkers then cut it out. I then inked up the stamp again using markers, stamped it and cut it out. I stuck the watercolored flower on using a brad (from the Vintage Brads pack. I then matted it onto Rose Red CS that I distressed and adhered that to the Blush CS using dimensionals. 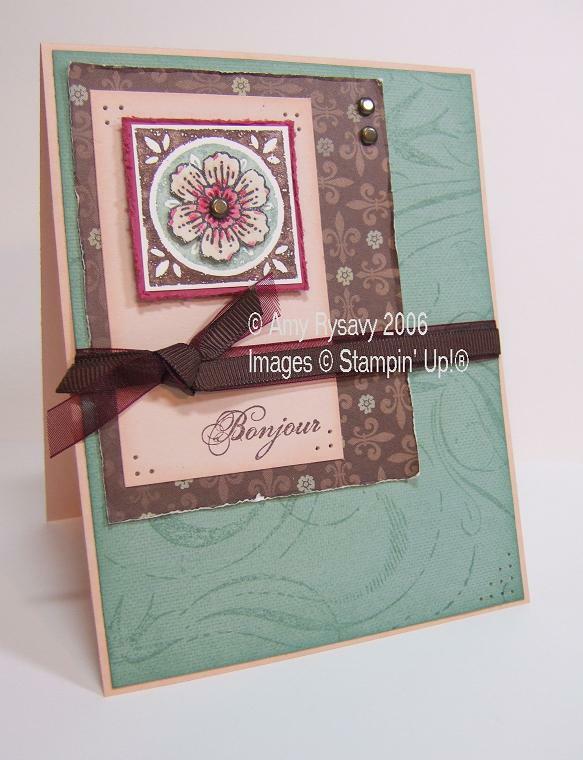 The Sage CS was stamped w/ both the Linen and the French Flair BG's - I LOVE the look of the Linen BG paired w/ other BG's - it gives a really nice textured/cloth-like effect. "You can also try clearing your cache. On Windows IE go to Tool>Internet Options>... Underneath Temporary Internet Files is an option to delete files. Click this. It will clear the cache and next time you hit refresh it will load the new images." That worked for me too as the old layout/colors etc would still come up for me but once I cleared the history and whatnot the new page look came up no problem! Anyway - like I said in the title of this post - I'm exhausted. I ended up taking Veronica to the hospital last night and was there for 2 hours. She got croup (all of a sudden too - she went from a runny nose and a cough to a fever in a matter of a couple of hours) and had started choking and was having trouble breathing. I was scared out of my mind - I've never seen croup before and didn't know what to do!! But after getting her some meds and whatnot she's doing a lot better. I stayed up nearly all night as she was up coughing and crying every couple of hours - poor kid!! The *one* bright thing about staying up tho was that I got a couple of cards done - I had Veronica on the couch by my desk so I did some stamping here and there while she slept. I'll get pics of the cards and upload them later today - AFTER I drink half a pot of coffee!! Ppl are commenting and e-mailing saying they can't see a difference (you're still seeing the blah all white w/ green page) on here - hit "refresh" on your Internet browser and it should show up!! If in a few days you STILL don't see it then there's something wrong!! Hitting refresh tho should work as I re-published everything and set it all in place!! 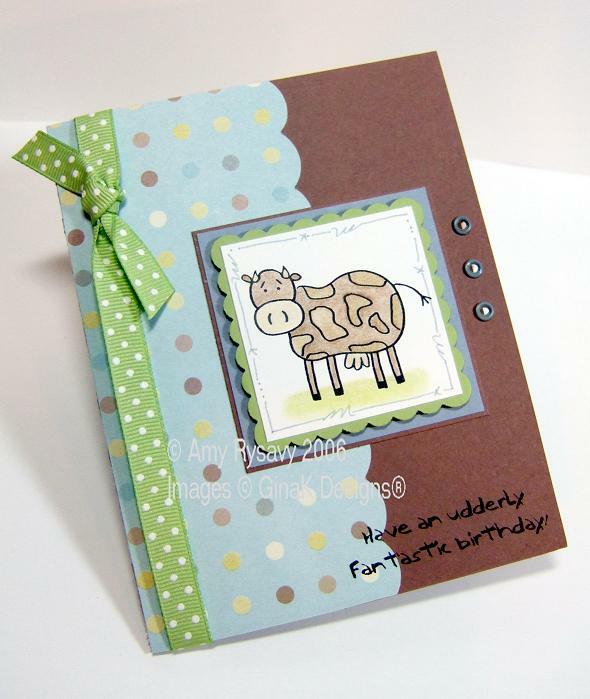 STAMPS: Cow and sentiment by GinaK Designs. 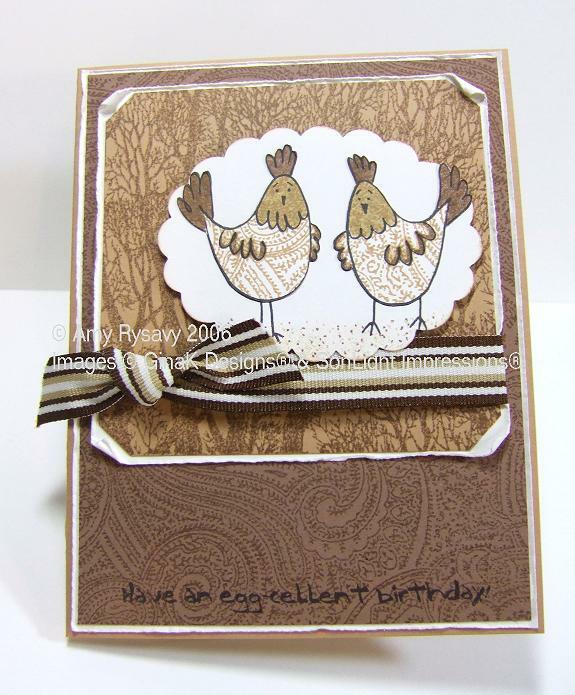 CS: Whisper White, Certainly Celery, Bordering Blue, Close to Cocoa - all Stampin' Up!, patterned paper by Provo Craft. INK: Palette Hybrid Noir (Stewart Superior), Bordering Blue Marker (SU!). ACCESSORIES: Ribbon (Michaels), Bordering Blue Eyelets (Stampin' Up! ), Marvy Giga Scalloped Square Punch, Dimensionals (SU! ), Prismacolors, Gamsol, and Blending Stumps, Small Corner Rounder Punch (SU!). Ya know, this is the *first* time I've used this little cow stamp from GinaK. He's so cute and I was a little shocked to find I'd never inked him up!! And of course the sentiment is super cute too *wink*. OK I'm done w/ the little lesson (tho I hope it helps someone!). After I colored in the cow I scribbled a little border around him, mounted him onto Certainly Celery CS (that I punched w/ my giga scalloped square punch) then mounted that using dimensionals to Bordering Blue and Close to Cocoa. The rest of the card was a breeze. I took a strip of patterned paper and made scallops along the one side (using SU's small corner rounder punch), adhered it and tied on some of my FAVORITE ribbon - I just love the color and the polka-dots! I adhered the main image, added some eyelets (w/ my wonderful crop-o-dile), and stamped the sentiment and that's it! STAMPS: Pig - GinaK Designs, oval - a*muse, Dotted BG (SU! ), CS: Whisper White, Pixie Pink, Cool Caribbean, Close to Cocoa, Chocolate Chip, More Mustard - all SU!, patterned paper by Provo Craft. INK: Palette Hybrid Noir, Close to Cocoa, Cool Caribbean. ACCESSORIES: Prismacolors, Gamsol, Blending Stumps, Marvy Giga Scalloped Circle and Mega Circle Punches, Flirty Ribbon (SU! ), Brads (SU! ), Colorbok fabric self-adhesive sticker, sponge daubers, dimensionals, various circle punches. A good friend of mine sent me a ton of fun Colorbok embellishments for my birthday - and I decided that now was the time to stop hoarding and start using!! This little fabric sticker was the starting point for this card. It's what inspired using the piggy stamp and the whole circular theme *wink*. I stamped the piggy, masked him, then stamped the a*muse oval to "ground" him, then colored him in w/ Prismacolors and Gamsol. I punched that out using the Marvy Mega Circle Punch, sponged the edges then matted it onto Pixie Pink CS punched w/ the Giga Scalloped Circle (and sponged *those* edges w/ Close to Cocoa). I stamped the SU! Dotted BG onto the card base, adhered the patterned paper to More Mustard CS, then adhered those to the card. I punched out several circles using my circle punches (some SU! and some EK Success ones), glued them on, then added that FAB velvet ribbon from the new SU! Winter Mini. I kept the ribbon in place by poking a couple of holes through it AND the card using my paper piercer (and yup I ended up poking my hand too b/c I wasn't paying the strictest attention! It **HURT**!!) then pushed through a couple of brads to hold it in place (and the brads *just* went all the way through - that ribbon is THICK!!). I then adhered the main image w/ dimensionals (I can't seem to get away from using those things - I've been using them on almost every single card I make!) and stuck on the Colorbok fabric sticker and the card was done!! So some of you noticed I have a new banner!! What do y'all think?? I got Sam to do it for me - she did Taylors and is prolly working on several others. For this one I actually drew and created the layout myself (just something that popped in my head one night and I went w/ it) - Sam just made it all a reality (and put up w/ me being a picky monster the whole way - AND was really cool about it all! LOL) and did the fonts and the textured effect and all that. I just find it so neat to see my silly little pencil sketch (I just scanned what I scribbled down and e-mailed it to her) all funky and in color!! So now I just need to tweak it some more so that it's either longer or centered as it's bugging me being all off to the left!! "My favorite thing is playing hilarious board games with my family. Bring on the crokinole, the cribbage, the pictionary. We laugh until we cry and our stomachs ache." CONGRATS NATASHA!!!! Send me an e-mail w/ your mailing addy and I'll get the goodies sent out to you!! I really can't say it enough - I really wish I had something to send each and every one of you!! There was 191 comments on that post!!! I am totally blown away by that, and I really DID read all 191 of them - I enjoyed reading about your Christmas traditions, your favorite holiday foods, the games you play, the things you want to do etc etc etc. The response was completely overwhelming and for that I am truly grateful. Look for more little "contests" in the future - I love doing them - it's fun to read everyone's comments!! I'll have more to post in a little bit - I have to get my girls into bed!! To be totally honest - we don't have a set tradition *yet* - BUT this year Veronica got SO excited as we put up and decorated the tree, and when I was done Tim lifted her up and helped her put the start on top - so from now on that will be one of our little traditions. We both really got a kick out of her dancing around and yelling about presents - it will be interesting to see what happens when the big day arrives!! On Christmas day and Boxing Day (a big thing here in Canada - basically it's "Black Friday" - all the stores slash their prices and ppl shop till they drop!! But you couldn't drag me out there - I love my shopping but not on Boxing Day!!) we go between our house, Tim's parents, my mom's, and usually my Aunt and Uncles (where my Dad and the rest of my extended family usually are). Neither of our families are very big so we end up seeing almost everyone at Christmas. I'm also kind of hoping that Tim and I can start a little Christmas eve tradition of putting the kids in bed and then we can relax, drink hot apple cider (I make a mean apple cider *wink*! ), and watch a movie together - although I'm sure in a few years the girls will be included in this as I remember never getting in bed till midnight when I was younger! !